Once Release 3 is introduced there will be a change to the way that the supplier status is displayed. The new status indicator box replaces the blocks and target on the supplier profile page. See below. Figure 1: Supplier profile page. The new status provides the supplier a status for the plan they have signed up for. This is their Target level Status. 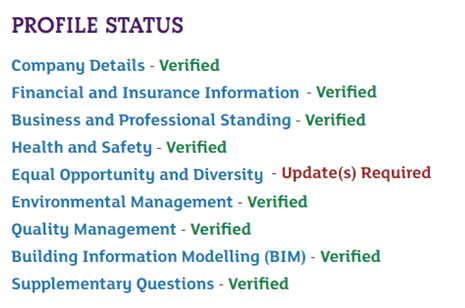 Suppliers will only appear as “Verified” on the supplier profile page once at least one work category along with all sections required for their plan they have signed up for have been verified e.g. for a Gold customer all C1-C4 plus O1-O4 & L3 sections need to be verified; for Silver or Bronze C1-C4 with at least one work category. Figure 2: Supplier card view in search results. The status displayed within the supplier card remains unchanged and is as was before R3. This status is based on the supplier’s current level rather than target level. In the majority of cases the target level and current level status will be the same. If for example a supplier has signed up for Gold and their O section has expired this may be displayed as Silver verified on the card (current level status), however as updates required on their profile status. The Profile Status will show which sections require update.